O serviço all inclusive é excelente, as comidas são muito saborosas e é servido sempre a vontade. Para ir con niños, el tobogán del parque acuático. En la pileta del hotel los dos toboganes son simples pero entretenidos. Los paisajes desde la habitación La comida es simple y no demasiado variada pero es rica. Lugar excelente, não falta programação para as crianças. A opção all inclusive é perfeita. A alimentação é farta e de boa qualidade. Tem várias bebidas, deliciosos drinks e petiscos o tempo todo nas piscinas. Também tem opções a noite para os adultos, como shows, música ao vivo. Nós amamos, o meu filho se divertiu muito. Sistema tudo incluído, somado ao atendimento e as opções de lazer dadas pelo hotel. Ótima acomodação, comida boa e diversificada muito bom para passeio em família. Gostei muito da estrutura do hotel, é uma propriedade imensa. Ideal para famílias: muita diversão para crianças e adultos. Bom custo X benefício. Atendimento dos funcionários. 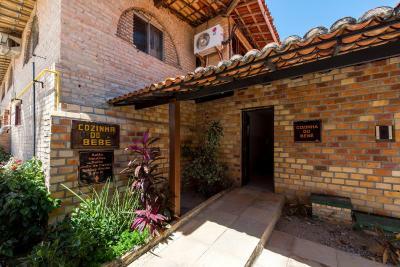 Lugar excelente para descansar e curtir a natureza, fazendinha linda, animais bem cuidados, muito bonito e confortável, café da manhã tb muito bom e toda equipe de funcionários do hotel sempre prestativos. Hotel Parque das Fontes This rating is a reflection of how the property compares to the industry standard when it comes to price, facilities and services available. It's based on a self-evaluation by the property. Use this rating to help choose your stay! One of our top picks in Beberibe.Located in the city of Beberibe, on the bay beaches, nestled into an area of 262 ft² by a fishing village surrounded by dunes, cliffs, lakes and cystal clear bays. It is a true ecologic paradise. All this can be found just 50 mi (1 hour) from the international airport of Fortaleza. The facility includes the Aquatic Park, open from Sunday to Monday, which faces the ocean and the hotel sector beside the water park. Some rooms face the water park and others face the gardens.Ocean view suites are offered as well. The hotel has a restaurant and a bar at the swimming pool. When would you like to stay at Hotel Parque das Fontes? This air-conditioned chalet features a TV, and private bathroom with a hot shower. This apartment features a balcony, air conditioning, a mini-bar, a TV, a telephone, a safe and a private bathroom with a hot shower. This chalet features a TV, air conditioning, a mini-bar, a telephone and a balcony with a garden view. The private bathroom comes with a hot shower. House Rules Hotel Parque das Fontes takes special requests – add in the next step! Hotel Parque das Fontes accepts these cards and reserves the right to temporarily hold an amount prior to arrival. Please note, the water park is open from Sunday to Monday. Please note that WiFi is available only at the reception area and at the Snack Bar area. All-inclusive services are available from 07:00 to 23:00. All inclusive e a estrutura do hotel. Terrible food, only breakfast was satisfied. Restaurant and pools was extremely dirty. View and location are perfect.